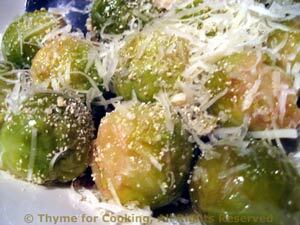 Italian Brussels Sprouts, Thyme for Cooking easy vegetable side dish. These are steamed until tender, and finished with Balsamic vinegar and Fresh Parmesan. Simple. Trim Brussels sprouts: slice a bit off of the stem end and peel away the outer leaves - any that are damaged or discolored. With the tip of your knife make a small X in the stem end - that, supposedly, aids even cooking. Put in a steamer basket over an inch of water and steam until done, 15 - 25 minutes, depending on size. They are done when you can easily pierce them with a sharp knife. Don't over cook or they can be a bit strong tasting and mushy. Remove from pan and empty the water. Return pan to heat and heat the oil. When hot add the sprouts and sauté for 2 minutes. Add vinegar and toss gently.